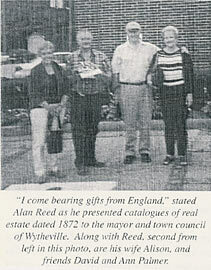 Reproduced here is a report of a visit by Alison Reed and her husband, Alan, both partners in the local firm of solicitors, Bennetts, to Wytheville, Virginia, USA. Being received in the year when Wrington commemorates the tercentenary of the death of John Locke, it provides a further reminder of the links between the West Country and North America. On the morning of October 13, 2003, the sun was shining brightly when a light colored sedan drove into the parking lot of the municipal building in downtown Wytheville at 11 am. Waiting to greet four English visitors who stepped from the automobile were Trent Crewe, mayor of the town of Wytheville, Stephanie Porter-Nichols, editor of the Wytheville Enterprise, Frances Emerson, director of museums for the town of Wytheville, Frisby Smith, Vice-president of the Wythe County Historical Society, and Adelaide Smith, publications committee member for the Wythe County Historical Review. The story of why these English visitors arrived in our Southwest Virginia town had a beginning that goes back at least one hundred thirty years. The English visitors Alan R. Reed and his wife Alison G . Reed are attorneys in the law firm of Bennetts Solicitors & Attorneys located in Wrington near Bristol, England. Their friends and traveling companions David and Ann Palmer accompanied the Reeds to the United States on this pleasure trip to celebrate the 60th birthday of Alan Reed. The fact that Wytheville became an important part of this pleasure trip came about in the following way. Reed's law firm, Bennetts, formed circa 1768, had a multitude of files and records. A number of years ago. soon after Reed began his career with the firm, he came across a real estate catalogue advertising land, dwellings, mines, and farms for sale in the southern and western parts of Virginia and in a few states bordering Virginia. In addition there was a supplemental catalogue. Edward Shelley and Co. of Wytheville produced the catalogues. and D.A. St. Clair of Wytheville printed them. The catalogues bore a date of 1872. These Virginia land advertisements had been sitting quietly in the dark on a shelf in the strong room at Bennetts for more than a century. Alan Reed felt strongly that something should be done about them. In a letter dated July 3, 2003, to Frances Emerson he had these words to describe his own thoughtful reasoning about these Virginia farms for sale. I immediately wondered why a Virginia real estate broker would be looking to sell farms in Virginia to potential emigrants from Bristol, England. An answer was given to me by Sheila Robinson, an American law student, who was working with me. ...She suggested that a considerable amount of property would have been for sale in Virginia then because many local people would have lost their lives or livelihoods as a result of the American Civil War that ended some 7 years previously in l865. ...She reminded me that Virginia had been an early English Colony which almost undoubtedly had close connection with Bristol because of Bristol's major tobacco manufacturing concerns which imported substantial amounts of tobacco from the southern states. ..[Thus] I had an explanation for the catalogue being in my office which I am bound to say I regard as an intriguing piece of English/American social history ... perhaps some families did indeed emigrate to Virginia from Bristol and maybe their descendants are still living and working the same farms or living in the locality. After pondering over the matter for a number of years, Alan Reed decided in the summer of 2003 to find out if the people in Wytheville might be interested in his discovery of these old real estate catalogues. In the first document there were 96 numbered descriptions of properties for sale. The sites in Virginia were located in Wythe, Pulaski, Grayson, Montgomery, Smyth, Washington, Buchanan, Carroll, Floyd, Franklin, Scott, Bland, Lee, Pittsylvania. and Roanoke counties. In the supplemental catalogue there were 180 entries, and the following directions appeared at the end of these entries. George Norcroft, General Agent, 2a Castle street, Liverpool. James Hartley John, Esq., Solicitor, 1, Cannon street, Birmingham. D.O. Thomas, Esq., Rolling Mills, Pontypridd, South Wales. Reed's first step in carrying out his decision to bring these documents to Wytheville was to use the international phone line. On Wednesday, June 25, 2003, Marilyn Jackson, secretary to Mayor Trent Crewe, answered the call from Alan Reed. She relayed the information to the mayor, and both were excited about receiving a gift of local history. Thus began a series of 'phone calls, faxes, and e-mails between Wytheville, Virginia, and Wrington, England that covered a time period from June to October. Mayor Crewe appropriately appointed Frances Emerson, director of museums, as the main contact for working out the plans for the English visitors to come to Wytheville. Emerson along with Rosa L. Jude, director of public information/tourism for the town of Wytheville, soon had plans underway for the day that the English group would arrive to present the documents to the Wytheville Town Council. The Reeds and Palmers arrived on Monday morning. Their day in Wytheville would include local sites that would have historical association with a flavor of Anglo-American connections. Before leaving the municipal building, Mayor Crewe escorted the group on a brisk walk through the halls where they viewed paintings by local artist Elsie Stephens. These paintings of homes and buildings in the historic district of Wytheville served as a brief introduction to the day's tour. Ken Baker, a local retired business owner and volunteer bus driver, had the town bus waiting in the parking lot, and the touring group started on a sight-seeing adventure. The English visitors had read the description of real estate in Wytheville and Wythe County of the 1880s. Now they would see some of the same area as it was in 2003 - well over a century later. The first stop was at the Wytheville Training School. The director, John Johnson, a popular local historian and authority on racial issues, greeted them. Here the English foursome had an opportunity to hear comments on the American Civil War, the history of slavery, the Reconstruction Period and the Civil Rights Movement.